After a run of gorgeous blue sky days, the day of the Third Annual Snow Leopard Festival dawned cloudy with the likelihood of rain in the forecast. Only when we hit the street for our walk from the kvarteera (flat) to the town square did my two daughters and I realize how windy and chilly it really was. 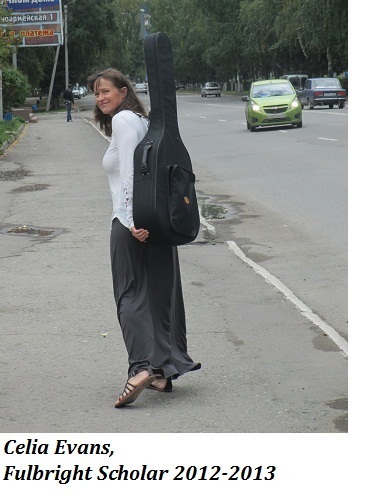 My scholarship is for three months of teaching and research in Gorno-Altaisk in the Altai Republic of the Russian Federation, but my alter ego is a folk singer/songwriter. Being familiar with the area and having colleagues who know me here has already opened doors that I hadn’t anticipated but am happy to walk through! 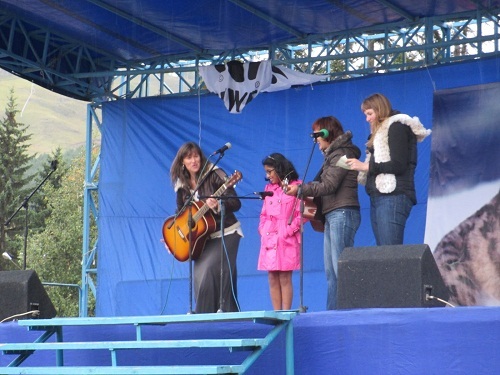 Within 2 days of arriving in Gorno, I was asked to perform a song at the Snow Leopard Festival. Let me try to explain. Snow Leopard populations exist in some of the tallest mountain regions in Central Asia including Tibet, the Himalayas, and the mountains in the southern reaches of the Altai Republic of Siberia. They are endangered to the extent that there may only be about 6,000 animals left in these wild and fairly isolated populations. Illegal hunting still occurs for the beautiful warm fur and the organs (apparently used in traditional Chinese medicine) of these spectacular cats. Gorno-Altaisk, the capital of the Altai Region has hosted two previous Snow Leopard Festivals, making last Saturday’s festival the third annual. The festival is organized by multiple regional, city and non-government organizations working together to develop an entertaining, international, and educational day on the town square in Gorno. Among the groups instrumental in the initiation of the festival is the Snow Leopard Conservancy located in Petaluma California and founded by Dr Rodney Jackson, an expert with over 30 years of experience of working in the field in snow leopard ecology and conservation. Another group, The Altai Assistance Project founded by Chagat Almashev, located in Gorno-Altaisk, is heavily involved in organizing the program for the festival. This is how I was given the honor of being involved. I have known Chagat for some years and have met him several times in my travels to the Altai (twice before) and his visits to the Adirondacks on at least a couple of occasions. Chagat has been instrumental in developing connections between the Altai and the Adirondack region, Montana, and the west coast of the United States. Just about anyone who visits the Altai with an organization or environmental or cultural mission knows Chagat. My friends in the Altai know that I am a singer/songwriter and on my first visit to the Altai (in 2006?) I was inspired by the people and the place to write a song that my colleagues and I sang together at our last communal supper before leaving the next day. The songs title "Golden Mountains" is a direct translation of 'Altai' and the song is about the beauty of the land and its people and our shared love of places wild and beautiful. Chagat liked the song so much (my friend and colleague Natalia shared the recording I made for her) that he adopted it as the official song of the Altai Assistance Project a few years ago. Since that time several groups of students have learned it and it has been incorporated as background music for a cultural video made by the organization. I am very honored by this! 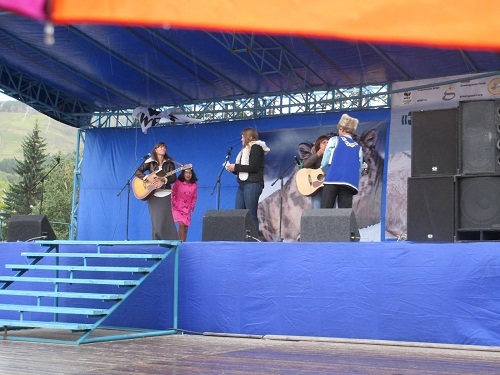 So, Chagat knew that I was in town as a Fulbright Scholar during the Festival time and honored me by asking that I perform the song amidst the colorful and creative plays and songs from children’s groups from the Altai and other countries depicting the plight of the snow leopard. Having kindly been leant a Fender acoustic guitar for the length of my visit here in Gorno, by a lovely woman who works at the University and works with Chagat Almashev, I had a guitar to play. The same woman who lent me the guitar borrowed another one and agreed to play and sing with me, as did Lucy, a representative from the California group – Snow Leopard Conservancy. On our thirty minute walk to the Festival on the City Square in Gorno, my girls and I quickly began feeling like we may not have dressed well for the impending weather. At least we had an umbrella! It grew steadily cooler and more windy as we watched the wonderful acts that were part of the over 25 performances scheduled for the day. The clouds gathered and became more and more grey and dense. We huddled together for warmth as we stood near Lucy and Alice who were filming the event. Unfortunately, we had brought our down winter coats with us in our travels, but had no room in our luggage for the ‘fall jacket’ sort of coat that we each needed on the day of the Festival and would need for much of the autumn. 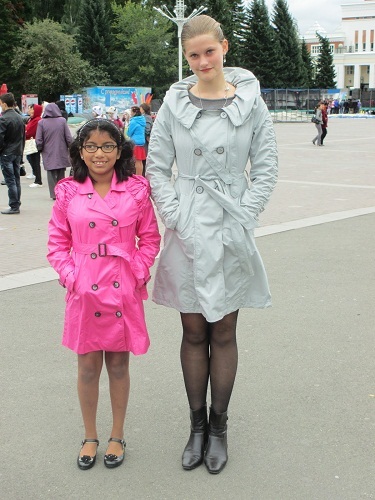 So, finally I relented and went into the shopping center on the square to buy coats for my girls who were bearing up as best they could but still shivering. The weather made for a relatively small crowd at the event, which has to be disheartening when so much time goes into the organization and preparation, but nonetheless, it was a really nice festival. Two acts before the singing of my song, it began to rain in earnest. I ran into the shopping center (we might call them small malls, there are many all over town) and bought myself a jacket that had caught my eye when I was buying jackets for the girls, so that I might still be able to play my guitar with functioning fingers! The images don't do justice to the intensity of the rain and wind. Golden memories to follow me home. My eldest was there struggling to take videos as her umbrella continued to flip inside out in the strong gusts of wind. I am in the Altai Republic with my daughters, among friends, new and old... How could it be anything but surreal and magical.. Thank you Natalia, Chagat and Fulbright for unexpected gifts!